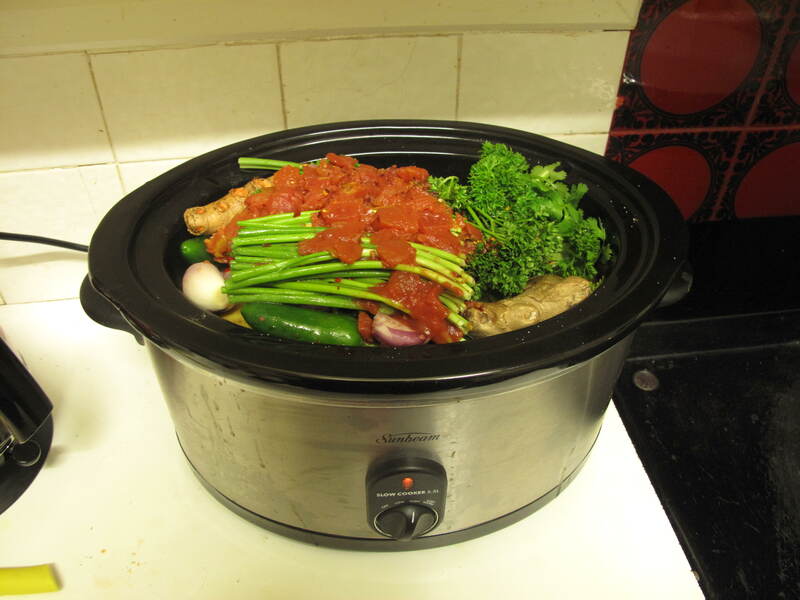 I bought the slow-cooker, pictured below, several months ago when I thought our electric stove/oven had had the bomb. It wasn’t until our electrician came over to do another job, that it was discovered that the switch to the stove was turned to ‘off’ somehow. Embarrassed, I admitted that I didn’t even know there was an on/off switch. Anthony used to do all this stuff, I said, meekly. No charge, said the electrician, wryly. Anyway, during all of those months when I didn’t think I had a working stove/oven, I learned how to use the slow-cooker and I love it! I used to chop everything finely but now I just throw it all in, uncut, and do the mixing/mashing when I get home. After all, why chop everything at 7am when you can just mash it at 7pm? In case it isn’t already obvious, one of the things I love about this kind of cooking is that you can be really creative, and experimental, because whatever you are cooking is going to take so long that you can easily get up at 2am and check for flavor. Sometimes the dish needs more salt; sometimes a bit of honey (if it’s a strong curry). Happy birthday to my beautiful great niece, N, and to my friend, M – nice partying with you! Looks and sounds delicious, slow cooking is my favourite my teeth not being what they used to be! Happy birthday to N and M and the combinations of flavours you’ve thrown together sound scrumptious! A few too many chillis! We have a slow cooker too. They are very good. What a time saving idea – chopping up takes quite a bit of time when you use plenty of vegetables. Cleverness isn’t my forte usually ha! Nieve isn’t’ one already is she!? I don’t think that is how you spell it!! I can’t believe it was a year ago! Did I tell you Louise got back from England on Thursday? She has terrible jet lag, poor thing! She has to go back to work on Tuesday and she doesn’t know how she will stay awake! Fortunately tomorrow is a public holiday here so that means she only works two days this week. Hope she gets through them. Your Mum was telling me about taking Gordon’s parents to your place and going to Gnomesville and everywhere. So many lovely memories! It is really warm here today, not disgustingly hot yet which is lovely! Yes she is one! I can’t believe it either! Love your cooking style! Throwing “stuff” in is also my style 🙂 Need to try this one!